MILWAUKEE, March. 28, 2019 – Baird announced today that it received a perfect score of 100 percent on the 2019 Corporate Equality Index (CEI), the nation’s premier benchmarking survey and report on corporate policies and practices related to LGBTQ workplace equality, administered by the Human Rights Campaign (HRC) Foundation. Baird joins the ranks of 571 major U.S. businesses which also earned top marks this year. The 2019 CEI evaluates LGBTQ-related policies and practices including non-discrimination workplace protections, domestic partner benefits, transgender-inclusive health care benefits, competency programs, and public engagement with the LGBTQ community. 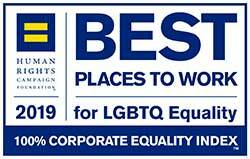 Baird’s efforts in satisfying all of the CEI’s criteria results in a 100 percent ranking and the designation as a Best Place to Work for LGBTQ Equality. Baird embraces and supports its LGBT+ associates, clients and communities. The firm is committed to creating a workplace where all feel welcomed and encouraged to be their authentic selves every day. Spectrum, Baird’s LGBT+ Associate Resource Group, celebrated its 7th anniversary this year and provides educational sessions, networking opportunities and outings for LGBT+ associates and allies. Spectrum has also formed partnerships with a number of community organizations including the Cream City Foundation, UWM LGBT Resource Center and is a leading corporate fundraiser for AIDS Walk Wisconsin.